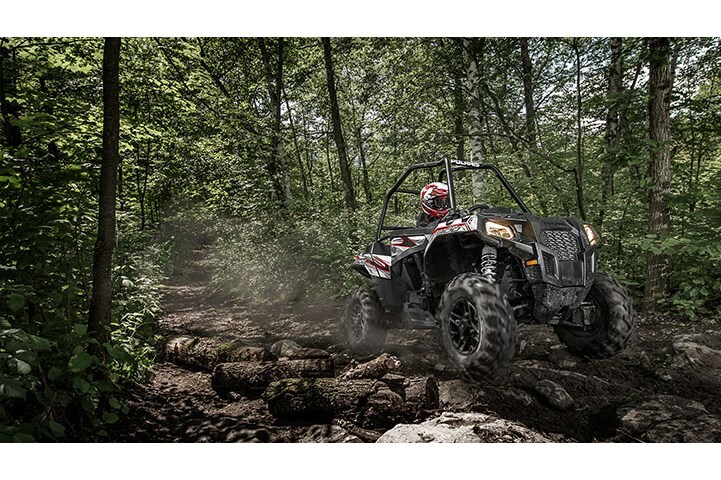 Powerful 60 Horsepower ProStar® 900 Engine The proven and powerful 60 HP ProStar® 900 engine gives you the power to tackle any trail. 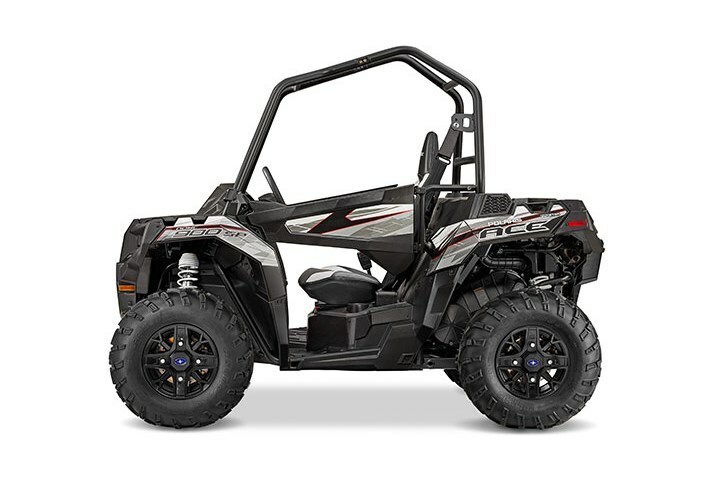 It features electronic throttle control, dual overhead cams, 4 valves per cylinder, and electronic fuel injection to precisely deliver the fuel charge for instant, predictable throttle response. Premium SP Performance Package ACE 900 SP is packed with premium performance features: New High-Performance Close Ratio On-Demand All Wheel Drive, Dual Rate Rear Springs, Front & Rear Stabilizer Bars, Sport Tuned Exhaust, New Factory Installed Doors with Custom Graphics, Variable Assist Electronic Power Steering, New High Performance Steering Wheel, Automotive Style Paint with Custom Graphics Package and Custom Cut and Sew High Back Bucket Seat. High Performance Close Ratio On-Demand All Wheel Drive (AWD) The high-performance close ratio AWD system is the fastest engaging AWD system available. The instant you need more traction the system engages all four tires to give you forward traction while working with the Electronic Power Steering system for precision handling. The system automatically reverts back to 2WD when you're back on solid ground. 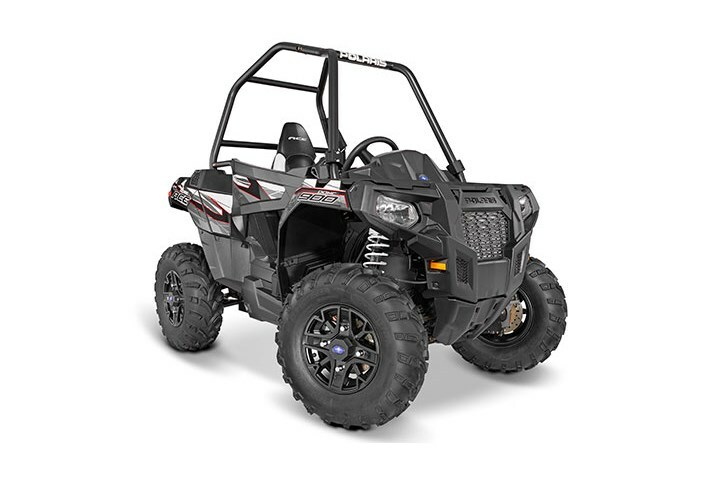 Trail Compliant 48" Width With a 48" width the Polaris ACE is designed to tackle tight, twisty trails and go where bigger side by sides can't go. Independent Dual A-Arm Rear Suspension A fully-independent rear suspension delivers 9.5 inches of travel for a terrain capable ride. 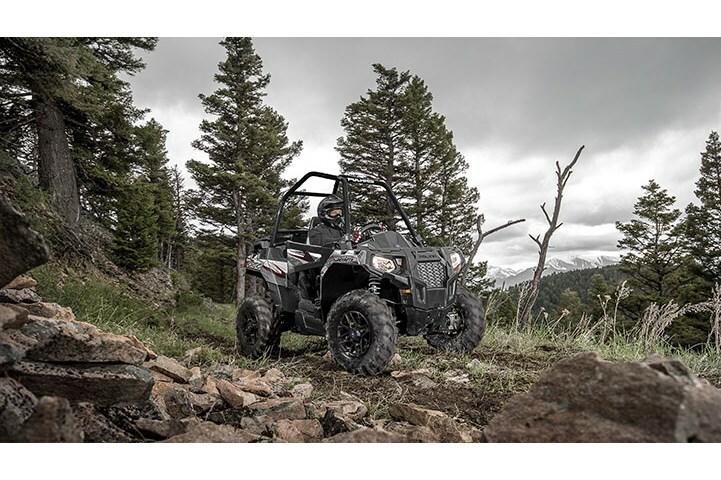 High performance rear shocks tout easy to adjust preload capabilities so you can tailor the legendary smooth Polaris ride for any terrain. 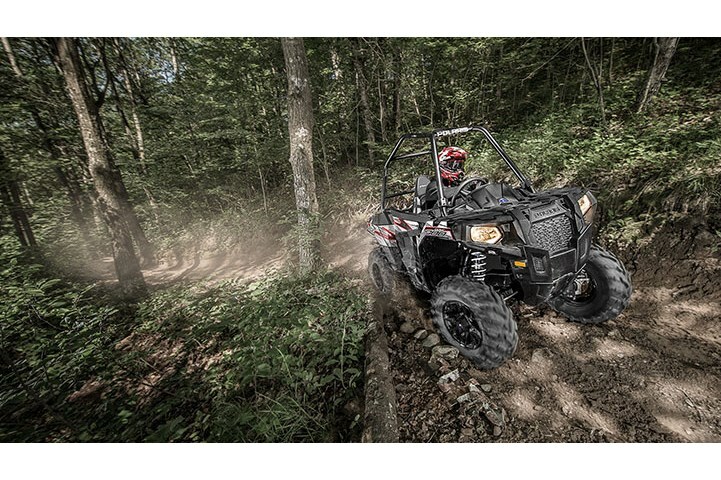 High Capacity Racks and Storage Polaris off-road vehicles have built an unprecedented reputation for work and the storage capability of the all-new Polaris ACE™ is no different. 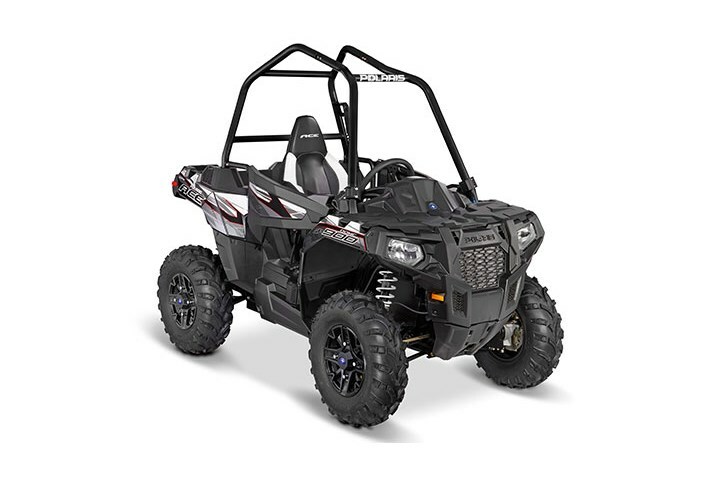 With an integrated front storage compartment and high-capacity cargo box, the ACE can carry up to 360 lbs of gear for any off-road adventure. 1,500 lbs. 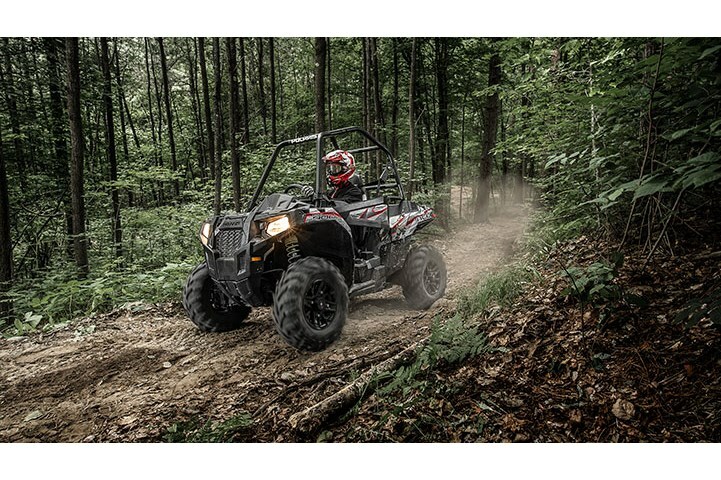 Towing Capacity The work ethic of Polaris off-road vehicles was instilled into the heart and soul of the new Polaris ACE™ including the power and capability to tow loads up to 1,500 lbs. Low Center of Gravity for Stable and Responsive Ride ACE features a low center of gravity and long 61.5" wheelbase for a smooth, stable and confident ride over rough terrain. Electronic Power Steering The smoothest, most responsive power steering available with variable assist for easier steering at lower speeds. 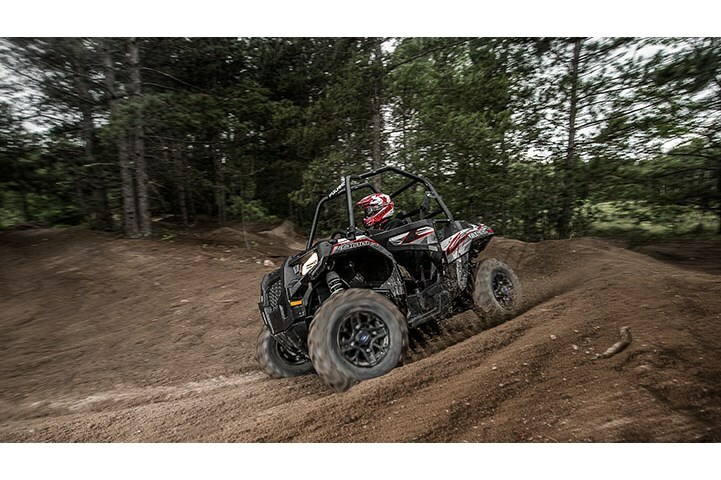 Our EPS lets you ride all day with less fatigue from steering. 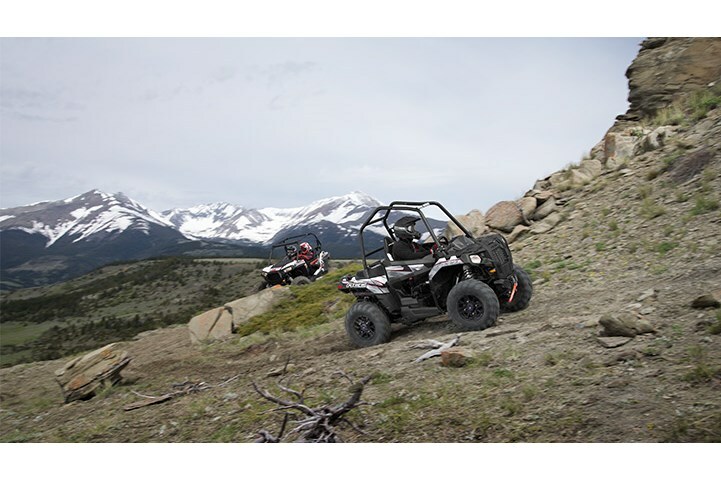 Sit In, Step Out Design Unlike any other off-road vehicle riders sit into and step out of the Polaris ACE making entry and exit easier and more comfortable than any other machine out there. Bolstered Bucket Seat Enjoy all day comfort with the high-back, bolstered bucket seat. The plush, side bolsters deliver both comfort and control by keeping you properly positioned so you can focus on the ride or task at hand. Adjustable Steering Wheel & Seat Slider Pull back on the lever to position the steering wheel for a perfect fit and optimum control. Raise the wheel completely or combine with 4” of seat slider travel to ease entering and exiting. Seat Belt Style 3-Point Harness Every ACE is equipped with a comfortable, automotive style 3-point harness system.